Meet the Young Artists Week gives audiences a chance to meet the new intake and hear them perform with those continuing for their second season. 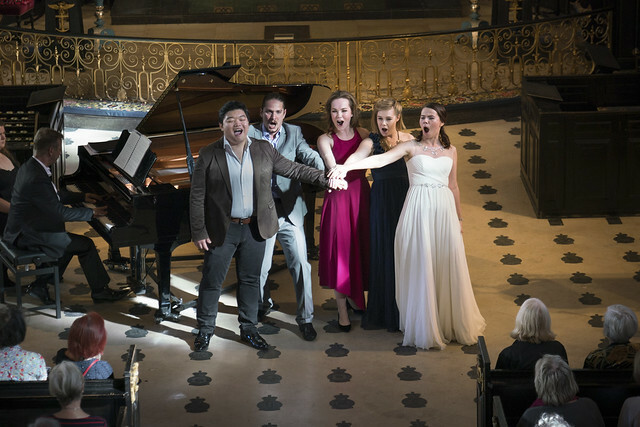 Meet the Young Artists Week opens with a recital where all the Young Artists perform operatic arias and ensembles, accompanied by the Artistic Director of the Programme David Gowland and with contributions from JPYAP music staff. One or more lunchtime or evening recitals of song repertory take place later on in the week, as well as lunchtime workshops. At the end of the week the Juke Box takes place, where the audience at the lunchtime session chooses the repertory for the evening recital, and can meet all the Young Artists after the evening performance. During Open Up, the chamber opera which has traditionally formed part of Meet the Young Artists Week, will be presented separately at a later time and for a longer run. Please note, most tickets for the recitals and Juke Box are free and bookable in advance. A number of day tickets are available from the venue on the day of each performance. All details are subject to change. Please check before travelling.